The music industry is changing rapidly, and the one constant seems to be that musicians don’t get rewarded for their talents! Keith Sue my founding partner, recently stumbled across a heart-breaking article by ABC’s Lisa Herbert, “Low pay, long hours and a changing market means musicians have to change their tune”. For those of your that don’t know us or haven’t met us yet…this is the stuff that gets us out of bed and makes us want to be part of the change. The article sparked animated and at times heated discussion amongst the Six8 team. It was almost a sense of relief to see someone else outside of the industry sharing our view and paying attention. One of the reasons that we founded Six8 was our concern over the stories we’ve been hearing from our friends, musicians that we’re close to and musicians that are no longer living as musicians. With the rise of digital music platforms the stories aren’t getting any better. Six8 was born out of our intense commitment to find or create an answer. Lisa articulates what we all know. Much like professional sport, unless you’re “top of the league” you don’t get paid enough to cover your costs. Somehow the industry has set itself up to only reward a few. This leaves a massive void for the many other talented artists to stumble around in. Hoping that they may get a break at some stage. People still don’t seem to value the real work that musicians do to bring their art to the stage. Far too often do we hear things like “why don’t you get a real job”. At Six8 we believe it is pointless to even argue over what our lives would be like without music. What we need to do is stand up and start taking action. We need to acknowledge that the real magic happens when an artist can perform and directly connect with their audience. It’s crucial for us to try and show how much we value the emotional response to music. Show how much it impacts our lives. Here at Six8 we are a growing community united in our belief that musicians must be rewarded for their amazing contributions to our lives. Most people that travel to a festival are passionate about live music. They are willing to buy tickets, travel, pay for accommodation and generally much more! They understand the intensity of experiencing a live setting which is something that you’ll never get from a digital experience. Don’t get us wrong we love our digital music too. We love music full stop; however, we know that without live music there is no engine room. Less opportunity to feel that vivid connection of sitting with a bunch of strangers feeling strangely united. How do we help live music flourish?!? What the team here at Six8 are doing is building a community. Where artists are valued, people interact in person and together we protect what we all value – Live Music and Connection. The Six8 platform is the an important first step in our vision to connect the world through live music. It provides an avenue for music enthusiasts to connect directly with artists in their local communities and invite them to perform live. We’re creating a world where artists can say ‘hey, here I am and here is what I am worth’. They set their performance rates. We ensure that they are paid for their many hours of curation, writing, rehearsing and ultimately their performances. We invite you to think of a world where musicians have the opportunity to perform regularly. Maybe in their neighbour’s back yard, plus a cafe a few suburbs away or at their local city’s festival. 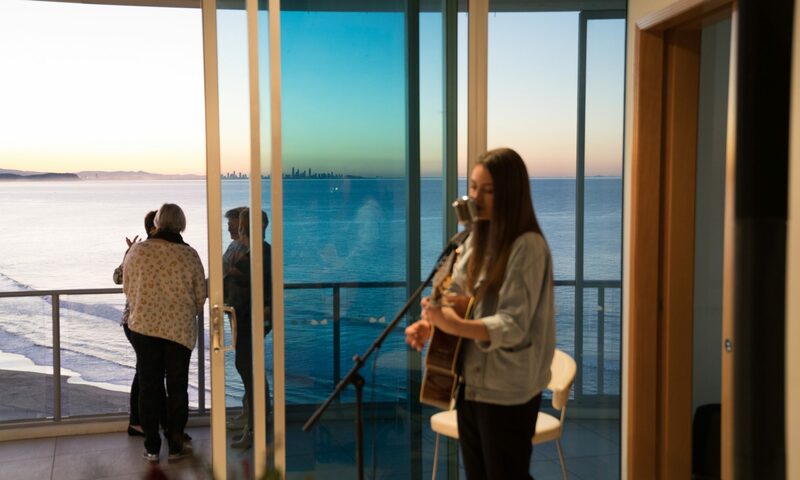 What about apartment blocks chipping in a few dollars each to hang out and say “hi” to each other with a local artist serenading from the balcony then joining in for a drink and a chat. As we start to spend more time in our homes and people choose uber eats and deliveroo over eating out, let’s not forget that our private spaces can transform into community spaces…we can invite our friends and family into our lounge rooms, decks or patios. Better yet they can become stages. We are already creating opportunities for artists to express their creativity and be paid for it as they deserve. We are already creating community connections that would never have existed before. Lisa’s article demonstrates the challenge is still real. Just like a musician needs time to grow and connect with fans; so, does our live music community. Join us and help drive the change! We can’t do it alone and we welcome anyone else that loves the feeling of experiencing music live. That connection you have with the person sitting beside you as you blast out a song together. That crazy inexplicable feeling you get just leading up to seeing an artist you love perform live. Those of you who know what I am saying I invite you to join our community committed to protecting and transforming live music. Our journey is bold, exciting, a little scary and only just in it’s infancy (like any good start to a story). Most likely we will upset a few people along the way. We believe that creating a world where more people are being brought together through live music is a world we want to live in.